For several years now, sustainability has been a very popular buzzword in our culture. It’s usually used as shorthand for a whole suite of issues including environmental responsibility, energy efficiency and protection of natural resources. Those things are all important. But as we look toward 2018 at Cal Poly, I’m also thinking of a broader meaning of sustainability. A big focus of our plans for the next year is ensuring that we remain viable, efficient and effective as we work to meet the growing demand for well-prepared Cal Poly graduates. More students than ever are applying to Cal Poly, eager for the Learn by Doing experience. But before we even consider inviting more of those students to enroll, there are several critically important conditions that we must meet as a campus community. First: Space. Before we can accommodate any more of California’s best and brightest students, we must make room for them. The new residential community, yakʔityutyu, is dedicated in honor of our relationship with the local Chumash. It is scheduled for completion in 2018 and will help serve that need by providing a cutting edge residential experience for more than a thousand students. This won’t affect only freshmen — it also makes room on campus for sophomores and even upper division students as well. Research shows us that the longer students live on campus, the better their graduation rates are, and we aim to provide that advantage for as many students as possible. But yakʔityutyu won’t be enough, so we’re already looking at ways to develop more on-campus housing on the north side of campus. This will allow us to provide the benefits of a residential education to more of our students, while also decreasing the burden of a student population on our neighbors in the surrounding community. It also means more classrooms and labs, where students get the hands-on education that makes Cal Poly distinctive. And of course, it also means more office space for the faculty and support staff that make that education possible. We do not intend to grow our enrollment until these needs are met. Second: Resources. 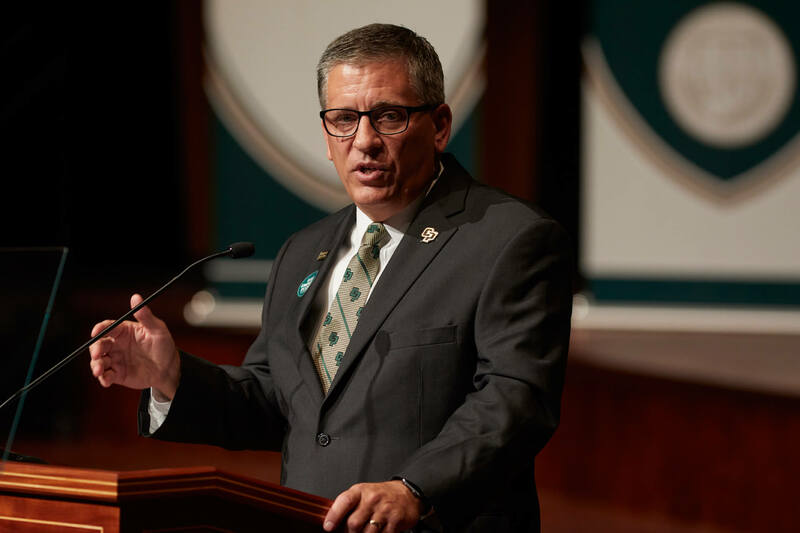 Before we bring any additional students to our campus, we need to consider how we will provide the resources that they will need to get an outstanding Cal Poly education. That means more funding, whether from the state, from our generous philanthropic supporters, or from new revenue streams in corporate partnerships and applied research. It also means more efficient stewardship of the resources that we already have. We need more tenure-track faculty to guide our students. A larger, better-supported and better-funded faculty is the core of the Learn by Doing experience, and we must be committed to providing enough excellent mentors to serve the needs of our student body. Third: Diversity. As a California public university, a crucial part of our mission is to serve all the people of our state. We recognize that if we are to serve California effectively, we must take deliberate action to ensure that we better represent California’s diverse population. To do that, we are reaching out to potential students in communities that have historically been underrepresented at Cal Poly and in higher education in general. We are working to recruit more diverse faculty and staff, because a diverse student body needs a diverse set of role models and a broad range of viewpoints from which to learn. We’re focusing on eliminating challenges and barriers to success for all our students, faculty and staff. We can eliminate achievement gaps for minority, first-generation and non-traditional students, and in 2018 we will unveil concrete plans that will help us make progress in these areas. These things must come first in any discussion of future growth to ensure that Cal Poly can sustainably meet the growing demand for our graduates. We are incredibly proud of what we’ve achieved in this past year. But to borrow from the parlance of my native Kentucky, you ain’t seen nothing yet.